Hasbro Family Game Night 3 is the third installment in the board game-to-video game franchise by Hasbro and EA. All of the games are more or less true to their board game counterpart, usually having some added mini games or interactive parts not found in the originals. All games can be played in either the Original version or a game mode called Remix, which adds new rules, switches gameplay mechanics, or simply makes it into more or less a new game entirely. There is also the option of playing a full game or a quick game for each of the five games (which either is made up of a much simplified board or fewer rounds than the full version). The game hub is an amusement park, where all the games are seen as rides or buildings and where the players pick which game they want to play. There is also the option of changing outfits for Mr. and Mrs. Potato Head (who can be seen wandering around the park). After a certain number of games have been played, mascots, confetti, statues and various items are unlocked for the amusement park. They fill no other function than adding visual flair to the hub. Clue/Cluedo: In this classic whodunnit game the players are cast as detectives who are all out to solve a murder by figuring out who did it, with what weapon and where it happened. In order to find out all of these things the players have to gather rumor points strewn across the mansion or by interviewing the guests of the house. Getting rumor points can trigger a random mini game which come in three kinds. One is a simple timing game where the player has to line up a brush by three finger prints, the second is a hidden object game where the player tries to find six specific weapons in a dark screen. The third has the player catching floating clues while avoiding red herrings. By adding up enough rumor points, the player can start a rumor and guess who, with what and where. The results will be added to the notebook as the players eliminate false leads. Interviewing people will slowly reveal a picture which gives a clue of either a weapon or a room in which the murder takes place. When the player has figured out all of the essentials, (s)he can go to the pool room in the middle of the mansion and line up the evidence gathered. If it all matches, the player wins the game. The Remix mode has the same basic game play but with added events, such as rooms getting locked off from investigation, suspects getting murdered as the game progresses and much more. Twister: This is the game out of the five which differs the most from its board game counterpart. The game plays like a 'Simon Says' rhythm game, much like Parappa The Rapper. A series of buttons will move along a beat line, and the player has to replay the segments shown by pressing the corresponding buttons. 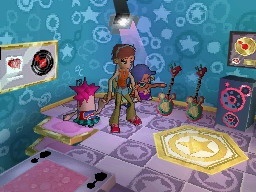 There are several songs to choose from as well as various difficulties. The Remix mode has the players take turns the game ends when the timer ends or when the game hits 10 bars' length. Whoever has the most points at the end wins. The Game of Life: The aim of this game is much like the board game. Live a successful life, get a good job, raise a family, retire with the most accumulated wealth. The way to do so is to travel across the game board (representing life) and hitting all the landmarks in a person's life: graduate, get a job, get married, get a house, start a family. The difference between the digital version and the board game is the inclusion of mini games at key points of life. They include; a memory game when buying a house, clicking all the green envelopes while avoiding junk mail to get a good job as well as a wedding party where a version of the previously mentioned Twister determines how much you'll recieve as a wedding gift from other players. It doesn't matter which player crosses the finish line first, as the money is all added up after all the players have finished. The one with the most money at the end of the game, wins. In the Remix version of the game the player earns extra steps by landing on money making spaces or minus steps if landing on money losing spaces. In this version it's a race to the finish , and the player to cross the finish line first, wins. Yahtzee Hands Down: This game is more or less a card game version of the classic game yahtzee. Instead of rolling dice, the players draw cards to make pairs, straights, full house etc. The twist here is that all cards also have to be the of same color. A certain amount of cards are placed in the middle of the table showing what combinations have to be achieved in order to score points. This version is turned based and each player (and computer) gets their turn to chance their hand around until they can lay hands on the points. In the Remix mode, however, the game is real-time and while everyone still gets their turn, there is a ticking clock and anyone can show a hand at any time. There is also only one point card at the time in the middle of the table and all hands are visible to all players. Mouse Trap: Just like the board game, the goal of Mouse Trap is to gather as much cheese as possible while assembling a Rube Goldberg-like mouse trap to catch the other players in before being caught yourself. In this digital version you are required to play a mini game in order to see how many pieces of the trap you can add (a minimum of one and a maximum of three). The mini game is a version of the classic game Pipe Dream where the player has to place tubes so that a steel ball can pass through certain "trap piece slots". The last player to be trapped after the whole mouse trap is assembled wins the game.